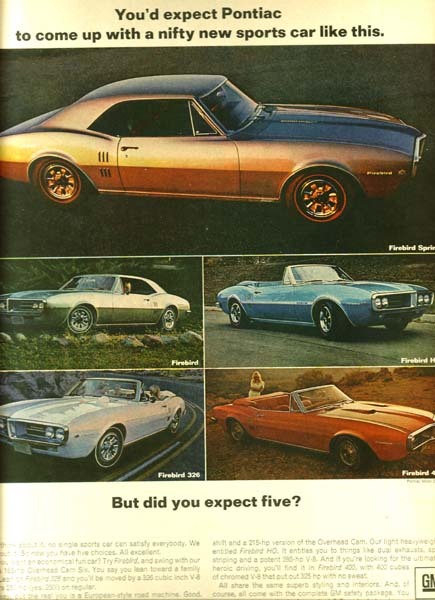 Pontiac Firebirds - Full color 10" x 13" ad that shows all five models offered this year. The ad headline asks the reader "You'd expect Pontiac to come up with a nifty new sports car like this - But did you expect five". This ad is larger than my scanner bed so the outer edges of the ad will not be visible in the scanned view. Pontiac Firebird 400 Convertible - Full color 7 3/4" x 10 1/2" ad has a photo of a Blue Firebird Convertible with the top down being driven by a young man on a curving mountain road at a high enough rate of speed that the scenery is a blur. The ad headline warns you that "After this, you'll never go back to driving whatever you're driving." Pontiac Firebird - Full color 10" x 12 1/2" ad shows a red convertible parked on a curving mountainside road as a beautiful girl stands next to it with her foot on the front fender. 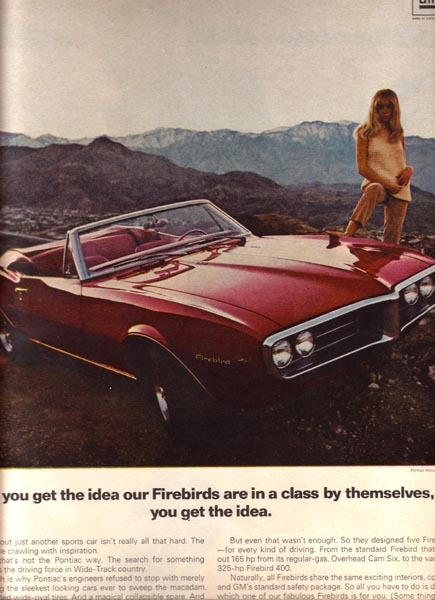 The ad headline claims that "If you get the idea our Firebirds are in a class by themselves, you get the idea." This ad is larger than my scanner bed so the outer edges of the ad will not be visible in the scanned view. Pontiac Firebird Convertible - Full color 9 1/2" x 13" ad has a drawing of a Yellow Convertible with the top down parked on a boardwalk next to a beach filled with umbrellas. The ad headline asks "Here it's 1968 and you've never played Wide-Tracking? Maybe you're not a great American sport". This ad is larger than my scanner bed so the outer edges of the ad will not be visible in the scanned view. Pontiac Firebird Convertible - Full color 9 1/2" x 13" ad has a drawing of a Green Convertible with the top down parked on an inclined roadway at the edge of a beach. Two couples are walking away from the water and toward this inviting car. The ad headline claims that "Wide-Tracking will never be a spectator sport. Obviously." This ad is larger than my scanner bed so the outer edges of the ad will not be visible in the scanned view. 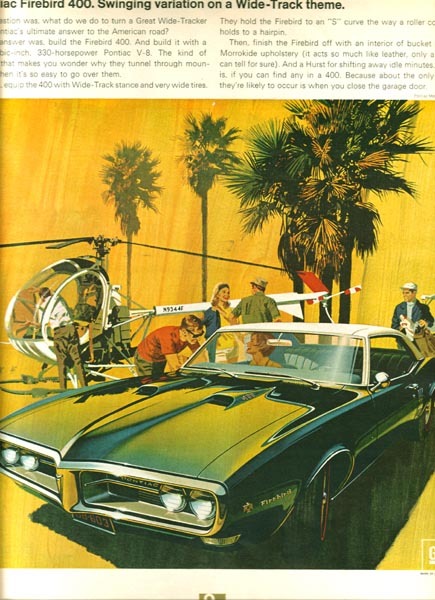 Pontiac Firebird 400 - Full color 10" x 13" ad shows a green Firebird parked on a golf course next to a helicopter. The ad headline says "Pontiac Firebird 400. Swinging variation on a Wide-Track theme." This ad is larger than my scanner bed so the outer edges of the ad will not be visible in the scanned view.